We present a whopping variety of Animal Figures to customers, which is available in distinct designs and sizes. We manufacture them using premium marble, resin, wood, and brass as per the requirements of patrons. 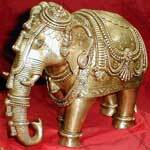 Animal Figures are mainly used for decorative and gifting purpose. They add elegance and charm to the house. Our Animal Figures have a nice finishing and long lasting nature. They are offered at reasonable prices.